When I was ten, my dad took me and my eight-year-old brother to the Statue of Liberty, and we climbed to the crown. 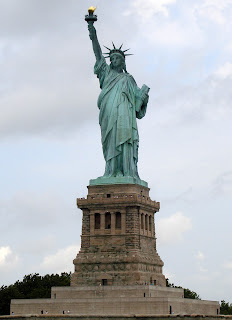 A day or two earlier, I had stood on the deck of the ship, happily gazing at the statue as we sailed into port. Now a long line of tourists slowly moved up the spiral stairs. It was mid-August, hot and humid, not the ideal time for this visit. But after a year in Europe, we were in good shape, having walked, hiked, and climbed the tourist attractions of over a dozen different countries. The view from the top was terrific. This statue was a gift from the people of France to the people of the United States. Construction began in the 1870s. It was built in sections, some of which were exhibited at international expositions during the construction process. In 1882, Americans began raising money to build the pedestal. 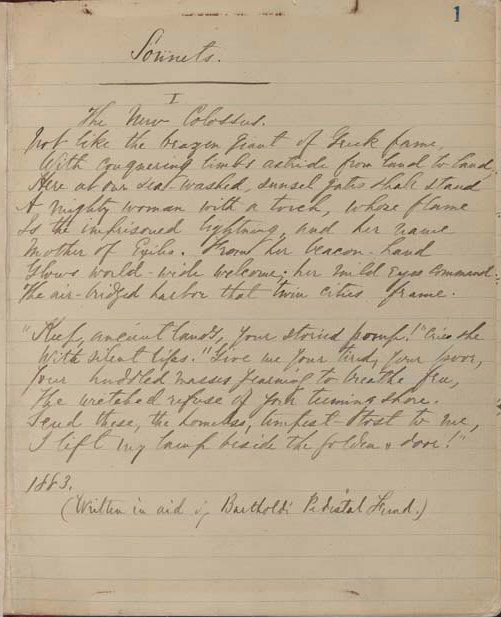 One of the works donated to a fundraising auction was a poem by Emma Lazarus, entitled "The New Colossus". The title refers to a statue known as the Colossus of Rhodes, one of the Seven Wonders of the ancient world. In 1903, the poem was engraved on a plaque and mounted inside the pedestal. The last few lines are often quoted to describe America's promise as a place of refuge from oppression, a land of freedom and the opportunity to realize the finest ideals of the American Dream.